I’m rediscovering the art of cooking. It’s fantastic, really. Because I grew up eating very ordinary, dull meals. My mom admitted she didn’t like to cook. Bless her, we were always fed, we never went hungry. So I’m not complaining, by any means. But what my inexperience in the kitchen meant, was that I didn’t know how to cook once I lived on my own. It was only thanks to the culinary pursuits of my girlfriends that I learned to bake bread from scratch (I even received a huge kneading bowl, that I still own), I found out what zucchini and sweet potatoes and eggplant were, and how delicious they could be. Hell, I even learned how to dice carrots and mince garlic! But then I started to waver a little – living with roommates who didn’t embrace cooking, or more recently, living on my own. Being a bachelor is what truly killed the chef inside. Because I didn’t have anyone to impress, no one to share and appreciate a meal with, I began cooking as simply and as quickly as possible. This meant a lot of canned soup. Or Annie’s pasta (a “healthy” Kraft Dinner) if I was feeling like a treat. But I’ve been blessed – my girlfriend is a fantastic cook & I’ve been bitten: I WANT to cook now, I want to do more than boil water, I’m baking veggies now (a baked veg salad the other night), I’m par boiling, I’m broiling, I’m excited about honouring the luxury of cooking – of having a kitchen (no matter how small), and vegetables in the fridge. 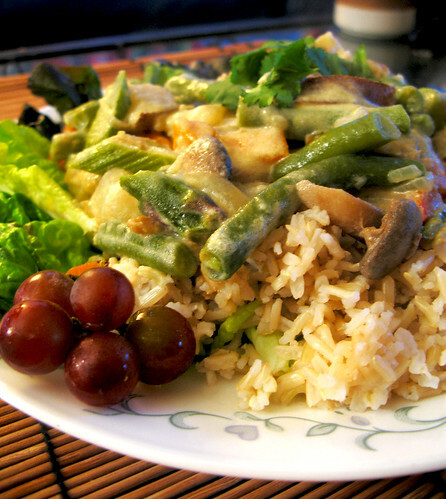 I’m writing this tonight because even though my girlfriend is at work, I’m preparing a green curry stirfry for myself. I’m putting in a lot of time to make something nice for myself, rather than just think, “I’m hungry, need to eat, then need to get on to important stuff” (I’m always pressuring myself to draw more, to work on & upload my photos more), but I know that eating IS important, and that cooking, the process of making the food that will sustain me, IS important, and tonight I am proud to be honouring my return to a lifestyle that includes the culinary arts.